As many of you may know, my boyfriend lives in Paris. We met over the summer and as things developed the reality of visiting him in Paris was clear but never did I think of going for the purpose of Fashion. Honestly! At the end of my last trip in November 2016, as a surprise we planned on me returning to Paris for the time slot PFW was scheduled to take place so I could potentially attend! As December rolled around I researched my tooshie off to try and make contact with Parisian fashion houses and public relations firms in hopes of attending shows during Paris Fashion Week, Pret-a-Porter. I quickly learned that this is not as easy to do as it is in NYC. It was honestly a full time job. I didn’t get much sleep emailing, emailing and more emailing all day and all night, asking whomever I knew if they had contacts in Paris, using Instagram and Facebook as another networking tool, also. It drove me crazy that I couldn’t just pick up a phone and call these people, too. Which is what I normally do as an everyday business practice. I did not care if I was only invited to one show during the week in contrast to the 89+ shows and events I’m normally invited to during NYFW. Just going to one show would have been enough! But lets face it, after going to one you want to keep going to more, right? RIGHT! So, after two months of only receiving one response after the hundreds of emails I sent, I began to get discouraged. However, I still told myself that one invitation is better than none at all and I am still very lucky to be going back to Paris anyway! This trip wasn’t just about PFW either, it was just a lovely highlight. Two weeks before my departure from New Jersey I had received a few emails to some presentations and one fashion show! Three events now, I was so happy even though I kept asking my boyfriend to check his mailbox for hard copy invites. 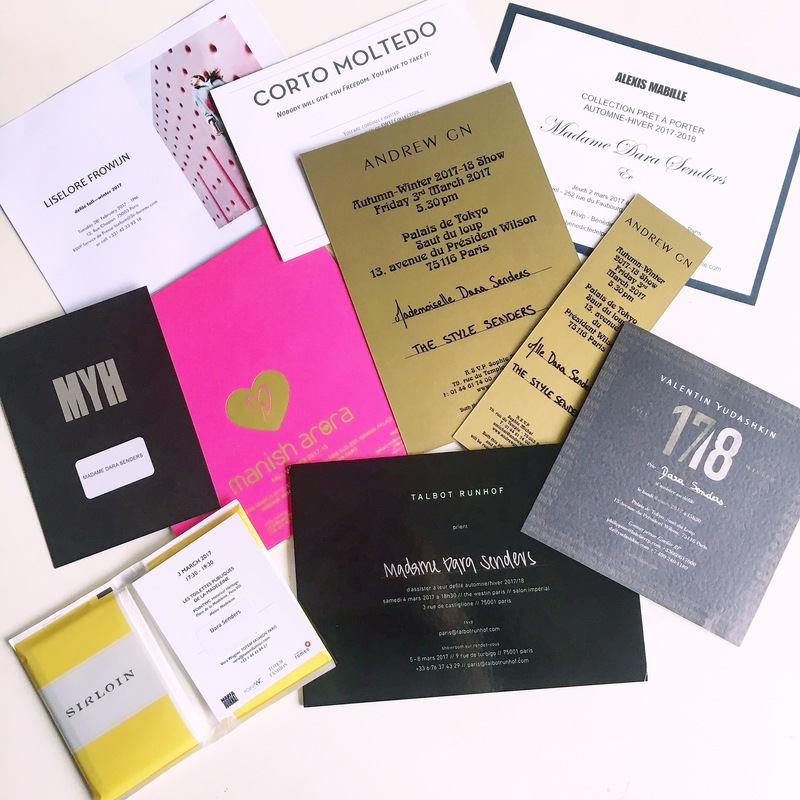 The parisiens do it right with physical invitations – the way NYFW used to be many moons ago! But still, nothing had arrived in the mail. When I arrived back to Paris in February I must have checked the mailbox everyday twice a day. But again, still nothing. About six days after my arrival, my boyfriend came home from work with a handful of envelopes behind his back and said, “So Dara, which one would you like to open first?! ?” I was sick as a dog with a bad throat infection but I think you may have been able to hear my screaming all the way back in the states! I was so excited and each day after tat, even when returning home from our trip to Amsterdam I received more and more invites in the mail! IT WAS THE COOLEST AND MOST SURREAL FEELING EVER! I still don’t feel like it ever happened!! After much doubting myself and my ability to be able to attend Paris Fashion Week I had received a total of 21 invites, both email and hard copy! It was such a thrilling, exciting, unreal, and outer body feeling! Your girl from New Jersey was going to PARIS FASHION WEEK!!!! On the first day of PFW it was a very beautifully sunny chilly day! I decided to go for an all black look with lots of texture! I chose my Bellefare reversible travel fur coat to stay warm and shielded from the possibility of rain (which unexpectedly happened often). I mixed prints and textures with a sparkly tweed blazer from Shegul and a white and gold metallic polka-dot button down from WhoWhatWear x Target paired with glitter ankle boots from Eloquii (similar) and a tassel detailed cross-body from ModCloth. Jewelry (similar) & Sunglasses were from Forever 21 & Dara Senders. Up Next Was Alexis Mabille and this show was much different from the first. It was in a somewhat hidden venue in Paris. It took me a few minutes to find the right door before the swarm of attendees showed up. I was a little early in fear I would miss the show. As everyone walked in we were placed in a huge rotunda that was lead by a long hallway which is where the runway was located. Actually, the rotunda acted as part of the runway, too. The collection was strong yet whimsical with lots of whites, navy, and gold with a feminine androgynous military feel. I really liked it. A female duo performance opened and closed the show. I just wish I could remember who the group was – I had their song stuck in my head for days following the show. Coincidentally, I was seated behind a fellow blogger Georgiana Boboc who is based in Paris. We met at NYFW a few seasons ago. We both remembered each other and caught up a bit about life and what other shows we had during the week. It is always nice to see familiar faces, unexpectedly especially when traveling! After this I went home and changed into something for the night time and headed to KONG Paris for a Fashion Week Party hosted by Fashion Blogger Valerie Sabban of Mademoiselle Valerie. It was a fun event meeting lots of different people and the girls from WhereToGet.it. Thanks for having my Valerie! After this I got dinner, went home to sleep, woke up the ext day to do it all over gain!! It was a blast!! 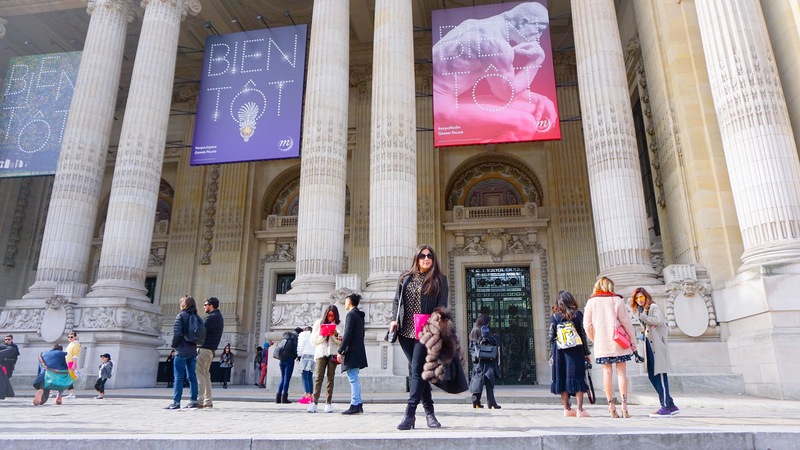 NEXT UP….DAY TWO AT PARIS FASHION WEEK! !